First of all, I want to remind people of the Ankerfest in Rudolstadt. It will be on Saturday, September 24th, and it will be an all-day affair, with most Anchor Friends staying over Friday and Saturday nights. The celebration begins at 10:00 AM and runs until 5:00 PM. Among the activities will be an opportunity to visit the factory, a children's program and an opportunity to build with Anchor stones. The celebration will be held at the factory, which is at 148 Breitscheidstrasse in Rudolstadt, Germany. Many new Anchor Friends will be there, if my e-mail gives any indication of the interest in this anniversary celebration. I will be there, as will many members of the Club of Anchor Friends. I anticipate seeing some "new" stones from the old molds and hand press -- especially the DS stones. Danny Batdorf, Brenham, Texas, USA, has sent me another design, a passenger train station, from his "Hometown" series of buildings. This series looks back at building designs which were common in smaller towns in the USA. Yes, many are now gone, having been replaced or just torn down. But such buildings are familiar to most Americans, even younger ones. In this sense, Danny's "Hometown" series is similar to the Modern House (American Bungalow, 200) Series, designed by Stephen Hurlbut, an American who worked in Rudolstadt between 1910 and 1913. The Modern House Series was introduced by the original factory in the USA market just before WWI. 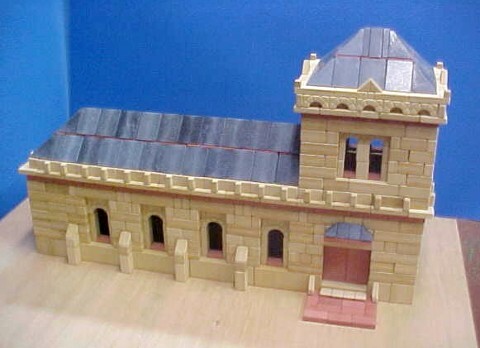 For a closer look at Danny's train station, take a look at the builder's page. The amount of additional work to do continues to grow; the discovery of the original molds has added even more work. I saw one mold which was used to make a stone I had never seen -- not even heard of. That mold was one of a pair -- a corner stone and a rectangular stone. The new factory has made a few samples of each. Of course there was no way to know the correct thickness. Close examination has shown that these stones are a new design for the roof stones of the DS (Dachstein -- roof stone) sets. I expect to see new samples, in the correct thickness, at the festival in September. For more information, you can e-mail me if you want one. Remember that the loose leaf format makes it easy to update your catalog. The next update is now scheduled to appear in 2006 or '07. This revision will be a major update, far larger than thought earlier. It will probably be as large as the current catalog! A second binder may be needed. This increase in size is not an indication of errors, but an attempt to get as much information as possible in this catalog. Since the catalog uses a loose leaf format, you will need only the new and changed pages. The amount of detailed information in this catalog is very great, and the information keeps coming in. And it has become clear that e-mails with just numbers of stones in a set just will not do; a photocopy or scan (in color if at all possible) of an actual packing plan is required. For the month of September, 2005.